Larger and faster than the Bad Dog, but these canine Heartless bark just the same. Physical attacks won't knock them off balance. Exploit their weakness to magic instead. The Bully Dog is an Emblem Heartless that is found in Kingdom Hearts 358/2 Days. It is one of the bosses at Beast's Castle. A Bully Dog resembles a large, purple dog with a massive head and an equally massive, toothed maw. Its ears are long, stand on end, and curl at the tips. It has a crooked, purple tail and four short legs with no discernible digits on its paws. Its long, pink tongue is often seen hanging out of its mouth. The Bully Dog's large, yellow eyes each sport a black spiral pattern. It also wears a large, yellow collar with several conical, silver spikes on it, though, because of the Heartless's size, it is worn around its waist instead of its neck. Its legs, the tip of its tail, and the tips of its ears are all orange. Its Heartless emblem is on its rear. The Bully Dog's name is a reference to a "bulldog". 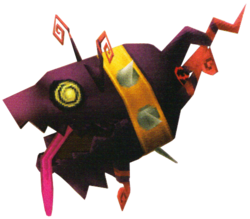 The former part of the Heartless's name could also reference its violent nature. Battling the Bully Dog should not be much of a challenge. It will lumber around the battlefield, making attack quite easy. It can attack by biting Roxas with its sharp fangs and by unleashing a shockwave from its mouth. So long as Roxas dodges its attacks and otherwise keep attacks constant, the Bully Dog should fall rather quickly. If utilizing Magic, the Fire Spell is recommended. The Bully Dog can be quite a nuisance if versing two or more at once so it is recommended to utilize magic and the Limit as well as carrying a few Potions. This page was last edited on 2 May 2018, at 01:26.